Which content creation tools should you use? Explore popular tools that help content producers and marketers create media: email marketing, video, motion graphics, presentations, blogs, infographics, podcasts, webinars, social media and chatbots. 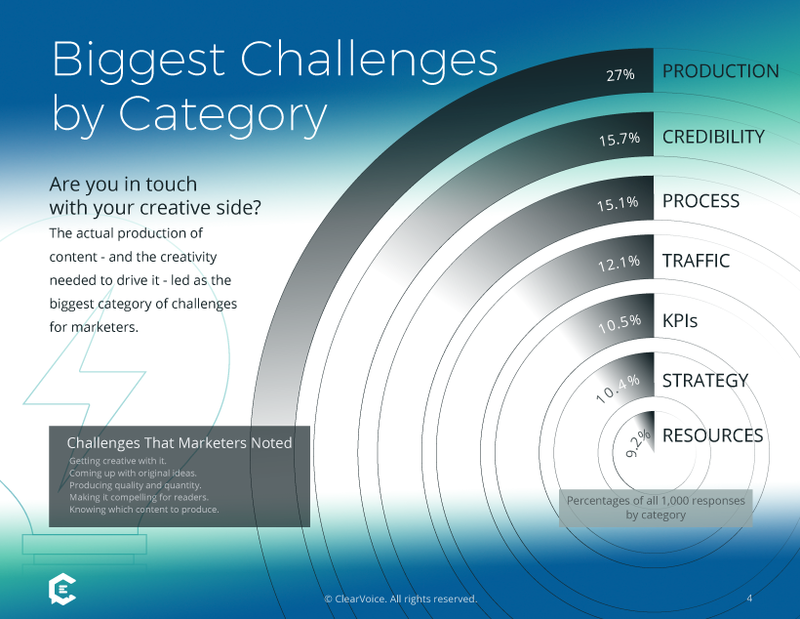 When ClearVoice surveyed more than 1,000 marketers on their biggest challenges with content, 27% cited the actual production of content as their biggest challenge. Not strategy. Not getting traffic. But the actual execution. That number jumps to more than 42% if you include the process behind generating content. These top content creation tools are easy to adopt, implement, and learn; they are relatively cost-efficient solutions; and when used correctly and consistently, they can make a huge difference in your business — and your bottom line. Movable Ink is a unique platform that allows brands to create and build compelling visual experiences for individual users. Movable Ink is designed with functionalities that provide unique visual experiences based on a user’s individual preferences to ensure a truly personalized experience. For example, Movable Ink helps target creative based on a user’s real-time location, weather, time, and device. This is interactive content at work! Hubspot popularized the phrase inbound marketing, and as such is one of the main tools any content creator should consider when looking for a solution for distributing their content. Not only do they have an easy to use interface, Hubspot’s content marketing distribution platform is second to none. From easy-to-build emails, to social media integrations and even chatbot functionality, Hubspot will impress even the most discerning marketers. BEE is your solution for creating beautiful, engaging emails. You can design a gorgeous, compelling email swiftly, thanks to the free email builder with drag-and-drop features. All you need is a message and a little creativity. The BEE plugin works seamlessly with your company’s mobile app. GetResponse gives you the tools you need to build powerful emails that look fantastic on mobile devices, tablets, laptops, or desktop computers. You can design landing pages to go with your email marketing campaigns, drawing potential clients closer and increasing conversion rates. Create automated features that coincide with your customers’ behavior, and craft webinars that offer value to your clients. ZenPen is a simple, streamlined text editor, dubbed a “minimalist writing zone” by its makers. Its purpose is to give you an easy way to create your written email content that can then easily be ported over to an HTML-friendly format. Once you have the copy just right, you can quickly and easily copy the email-ready HTML content and paste it right into your email sending platform of choice. With RawShorts, making explainer videos to illustrate processes and products is swift and easy. The program features a broad variety of video templates, plus a simple drag-and-drop video builder where you can insert text, transitions, effects, images, and much more. Once you’re finished creating the video, RawShorts makes it easy to share via Facebook, YouTube, your landing page, or other venues. When you need professional-quality videos at an affordable price, go to Magisto. Using normal, everyday photos and videos, you can create movies that support your business’s message and products. Magisto offers captions, themes, special effects, custom branding, editing tools, commercially licensed music, and much more. Cost: Premium version at $9.99/month; Professional version at $19.99/month; Business version at $64.99/month. Annual plans are available at a discounted rate. While SlideShare isn’t the most versatile tool on the market, it has the advantage of ownership by Microsoft and LinkedIn. That means broader network viewership and accessibility for the PowerPoints that you create. Show infographics, documents and presentations through this embeddable content channel and discover new ways to make SlideShare work for you. ClearVoice is the premier solution for creating content for your blog (or other marketing channels). Used by companies like Intuit and Cabela’s, ClearVoice has powerful features that help you discover new content ideas, find expert freelancers to help you write on topics in any industry, and then manage the creation workflow all within one tool. They offer an advanced version for agencies as well. What is often an arduous battle to get compelling content is made so much easier with ClearVoice. With a little help from Playbuzz, you can create a variety of high-interest, engaging pieces of content for your blog. Predictions, tests, quizzes, games and stories can be crafted using the Playbuzz platform and then shared via its extensive social channels. Playbuzz has an audience of over three million people. The Hubspot blog topic generator is a gold mine of ideas when you’re unsure about a content strategy or eager to find new topics to cover. Although HubSpot admits that the algorithms used for this generator aren’t perfect, it’s still a great tool for sparking new ideas and gleaning of-the-moment title ideas. Get a better idea of the cost for your content plans. See how you can power your content marketing with the ultimate content creation tool: ClearVoice. Sometimes, you need an image to get your point across to your customers. Just select one of easel.ly‘s many attractive templates, enter your data and other information, and you’ll have a fantastic, professional-looking infographic ready in just a few minutes. For infographics in motion, look to Animaker, an amazing tool that provides over 100 charts, 1000 icons, 3000 maps, and much more to help you jump-start your video infographic. Use Animaker to tell stories with your data, catch customers’ attention on social media, and achieve powerful marketing on a slim budget. Visme stands out from the crowd of infographics and animated marketing videos with its unique user-influenced style. Thanks to Visme, you can create graphics that move when the viewer scrolls down or mouses over them. Use the available widgets, beautifully crafted templates, icons and other tools to create professional-level motion graphics that engage and inform your customers. With Infogram’s wide range of templates and customization options, including interactive maps, you’ll be well on your way to publishing noteworthy infographics as part of your content marketing strategy. Infogram is being used by well-known organizations like Symantec, NerdWallet, Goodyear, LinkedIn, and EuroNews. Cost: Infogram offers a wide range of packages and pricing options, from a free plan and up to $149/month for businesses. Enterprise package options are also available. With ThingLink technology and tools, you can craft designer-level graphics that show extra content or text when your customers hover over the icons. ThingLink is a quick, easy one-stop shop if you’re interested in clickable or hoverable graphics — and as an exciting bonus, this provider can enable interactive 360-degree or virtual reality (VR) content as well. Cost: Basic package free, Pro package $25/month; Premium package $125/month. There are also different pricing plans available for businesses, educational institutions, and nonprofits. See more top tools for visual storytelling. According to the Audacity team, their product is “free, open source, cross-platform audio software for multi-track recording and editing.” This is a favorite tool for podcast creators. Thanks to the hard work of the Audacity team, the software continues to improve, with support for the most current browsers and operating systems. PodBean isn’t just about creating and editing your podcasts — it provides hosting services as well. The prices are very low, and the service is good. With PodBean, you’ll receive access to podcast themes, your own podcast site and domain, custom designs, ample bandwidth, priority support, and other coveted features. Are you planning to do an interview or an important call over Skype, Facebook, or a similar calling service? With Ecamm, you can record that session directly to your Mac computer and use it as a podcast later. This platform is designed specifically for Apple computers and related devices like iGlasses. Thanks to SpeakPipe, your podcast listeners can leave voice messages for you through your website. Testimonials, questions, feedback — it all becomes easier to collect and review when you’re using SpeakPipe. Your service includes a SpeakPipe button or custom button, plus a separate hosted voicemail page. Pippa is an incredibly easy podcast tool to use, especially if you are brand new to podcasts or have never recorded one before. Simply record your podcast, create a “show”, upload your file, and share. Pippa also offers free transcription services. Cost: Basic plan is free; Growth plan at $15/month; Influencer plan at $25/mth; Professional at $60/mth. Annual subscription options also available at a discount. Part of the popular GoToMeeting family of services, GoToWebinar is the most widely used webinar platform currently available. From practice settings and email automation to custom branding and mobile support, GoToWebinar provides everything you need for your webinar and more. If the GoToWebinar prices are out of your reach, investigate Zoom instead. A Zoom webinar can handle up to 100 participants and an unlimited audience size. A broad range of packages are available depending on your needs, and you’ll have access to cutting-edge features like one-click HD screen sharing, dual-screen support, post-webinar reports, and integration with CRM and marketing automation systems. StealthSeminar provides a “free webinar school” to help new webinar creators learn the basics of webinars and discover how to plan a high conversation webinar for their business. StealthSeminar offers both automated and live webinars, with such seamless automation features that viewers may never know you’re not conducting a live event. With Pablo, an extension for Buffer, you can overlay your message, quotation, or snippet of content onto a beautiful photo or a positive image. After installing the Pablo buffer app in your browser, you can highlight a catchy phrase or pithy quote from a blog or article. Just right click, send the phrase to Pablo, and pair it with an appropriate image. In just minutes, you’ll have an attractive bit of content for your social media channels. Who doesn’t love a fun quiz? Okay, that might sound a little crazy if you’re still in school and the term “quiz” haunts you in the night. That said, quizzes, if done right, can be an excellent way to engage your audience online. According to the Qzzr team, you can “create, embed, and share your own quizzes” with their easy-to-use tool. Not only does a quiz earn you more traffic, clicks and shares, it can also give you valuable insight into your target market if you design it well. Piktochart helps you out when you don’t have the funds to hire a professional designer. Using the templates and functions of Piktochart, you can quickly create spot-on graphics to use on social media. Grab a pre-sized template that appeals to you and your audience, customize it with your data, fonts and colors, and then make it part of your social media output for the day. It’s fast, economical and effective. At Pixabay, you can access over 1.2 million free stock photos, illustrations and vectors. When you need an image or two to spice up your social media content, just stop by Pixabay and do a quick search for videos, photos, or illustrations related to your topic. All the images and videos on Pixabay are totally royalty-free, and you are allowed to use them without attribution for commercial purposes. These last two content creation tools are for only the truly adventurous at heart. Despite shockingly high engagement rates (80% message open rates), most marketers still haven’t leveraged the power of chatbots. If you’re not sure what a chatbot is, I would recommend you take a look at this post where we give an overview of chatbots and then show you how you can set up a chatbot in about ten minutes. Chatfuel, one of the widest used tools for creating Facebook Messenger bots, is also one of the easiest. Chatfuel has a great user interface that allows anyone, without coding ability, to spin up their own chatbot. That said, it can be a gnarly process to think about how your bot should be built, from conversational flow to the actual user interface. In steps BotMakers, a chatbot template repository for Chatfuel bot content. BotMakers has templates for nearly every category, niche, and industry, including fitness coaches, cleaning services, food blogs, real estate agents and dozens of other categories. It is super simple to purchase a bot template on BotMakers and import it directly into Chatfuel. Cost: Template prices range from a $39 one-time payment to monthly payments up to $99. For a recent chatbot client, I jumped on the exploratory call with the company owner and his assistant. The company owner is well versed in technology, and as I explained how the bot would work he clearly understood. His assistant, however, was much less understanding and quickly became frustrated by our conversation. So, I set up a BotMock account for the client and used the tool to visually lay out how the chatbot experience would be delivered. After showing that to the assistant, all was clear and she quickly understood the value of a chatbot. With BotMock you can easily (no coding experience needed) create an interactive and high-fidelity mockup of a chatbot. It is highly visual and easy to use for collaboration and actually laying out the content of your bot. Time/Effort Needed: 1 hour to learn. Best For: Perfect for freelancers! Please note: All described features, plans, and prices were accurate as of the publishing of this article, and are subject to change.